Kitty Cat is the favourite pet and ONLY pet of the family. Kitty Cat can sleep all day if she wants, has food and snacks when she wants…life is perfect until the new pet arrives and upsets everything. 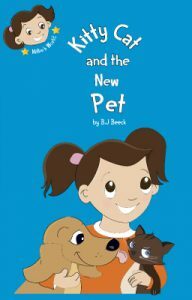 “Kitty Cat and the New Pet” is a new take on the original ‘new baby’ and ‘big brother/sister stories. This easy bedtime read, is all about adjusting to change like a new arrival in the family and the emotions that can go with it like jealously, loneliness and feeling left out. In my day job as a busy hospital social worker, I come across people everyday wanting you to sit down and take the time to listen to their story. Often it is a tragedy or a story of drama but sometimes it is story of great adventure and heroism. What amazes me most about listening to people’s own life stories is the multiple ways to perceive a reality and that within a family, each person can have a completely different take of the same events of the past. “Kitty Cat and the New Pet” is book one in a series called “Millie’s World”. Each book in the series tells the story of a different character in little six year old Millie’s world from their own perspective. Here in the story “Kitty Cat and the New Pet” you see what life is like for Kitty Cat and her reaction to a new arrival in the family. Now wouldn’t it be interesting to take the story from Digger, the new pet’s point of view. How different or the same would that story be? The original idea for the picture book series and the characters of six year old Millie, baby Max and her parents, Annie and Danny arrived (the pets came much later) after writing a post on my blog “bbillustrations.com”. With each blog post, I like to include a ‘Far Side’ like comic illustration that adds to the commentary. In this particular post titled “Stuff owns you, experiences grow you”, I included a little illustration of a little family of four dragging suitcases galore through the airport with the comment below “Six Flights, nine suitcases later, Mr and Mrs Jones concluded that they owned too much stuff”. This illustration was the original seed of an idea that grew into Millie’s World and the series. “Once upon a time, there was a cat called Kitty who lived with Danny, Annie and their two children, Millie and baby Max. Kitty had everything she could wish for. Her own door to come in and leave as she pleased. Warm spots to snooze on. And when she felt like it, playtime with Millie and Max. When I’m not creating picture books, I love to dance, run, eat ice cream and explore the world. Soon I will be taking off to slow travel the world, writing and illustrating picture books as I go. I am the author-illustrator of a picture book series called ‘Millie’s World”. The first three books in the series “Kitty Cat and the New Pet”, “My Friend Digger” and “In Millie’s World” are now available to read in ebook format. They will be coming soon in print and colouring book formats too for your collection.